The latest version of AxMaster is 2.2.4515, available on the downloads page. A full list of enhancements and changes can be viewed here, or check out the screen shots page for pictures of the software. 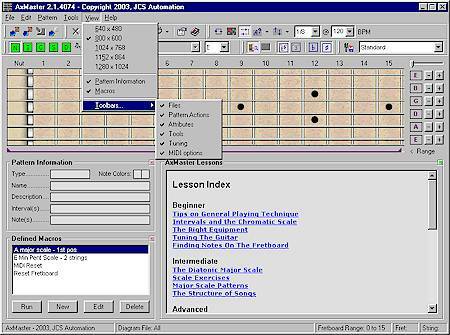 AxMaster offers several features to assist people in learning the guitar, as well as tools for instructors and guitar site webmasters. Fretboard displays can be saved as standard bitmap or jpeg images for use in other applications, with options for saving fret and/or string labels in any color combination. Completely redesigned interface, including customizable toolbars, dockable Advisor window, and support for different screen resolutions. An option has also been added to the program preferences (Misc tab) to keep floating windows on top. A Tip-Of-The-Day dialog has been added, that provides tips for using the software. The Glossary has been greatly expanded, and many new chord definitions have been added. Lessons are now categorized (Beginner, Intermediate, Advanced, and Miscellaneous). Several new lessons have also been added. The Ear and Fretboard training tool has been replaced with a much more usable Note Recognition tool and an Interval Training tool. Note recognition progress is tracked, and can be viewed in a variety of ways. A new Chord Decoder tool has been added, with several options for finding chords based on selected notes. Chords can be searched based on the order of the notes as entered, inversions, or in any combination. Notes can be selected by buttons, typed in directly, or selected from the fretboard with shift + left-click. Macros (previously called scripting and only available in the lessons) can now be easily created and edited to simplify complex or repetitive sequences of commands. The actual macro command string is also displayed, which can be copied and pasted into custom lesson content. Diagram definitions are now divided into categorized files, and the management of these files has been greatly simplified. AxMaster automatically loads all diagram files when the software is started. Individual files can be loaded for editing or for viewing a specific subset of Diagrams. Exchanging custom diagrams is now just a matter of dropping the new file into the Diagrams folder. An option has been added to the preferences (Diagrams tab) to reset the strings and fret range when a Diagram is viewed. MIDI functionality has been enhanced to provide smoother playback. In addition, a new MIDI toolbar has been created; common MIDI options can now be changed on-the-fly from the main screen, even while a pattern is playing. When two patterns are visible, you can now display notes that are common to both patterns, notes that are not common to both patterns, or notes that exist in only one of the patterns. How did you hear about AxMaster?